You may wish to insure your jewelry against loss, theft and damage. Although you might anticipate that your homeowner’s policy will cover the loss of your jewelry, most policies will only cover items that are “scheduled” (specifically listed). Your coverage may also be subject to a deductible. Coverage from different insurance companies varies. Companies typically require detailed information about your jewelry in the form of an appraisal. Compensation for lost or stolen items will either be a replacement of the jewelry or, less frequently, as a reimbursement for the listed value. We recommend that customers review their policy to ensure adequate coverage. An all risks policy is highly advised. It will cover damage to your jewelry as well as loss. This is particularly recommended for fragile stones such as emerald and opal which can be chipped or broken in everyday wear. Your homeowner’s policy is often a good source for jewelry insurance. If you would prefer to have a separate, all risks policy, Jewelers Mutual “Perfect Circle” offers personal jewelry coverage. Detailed information and an online application can be found on their website. For this type of policy expect to pay about 1% per year. 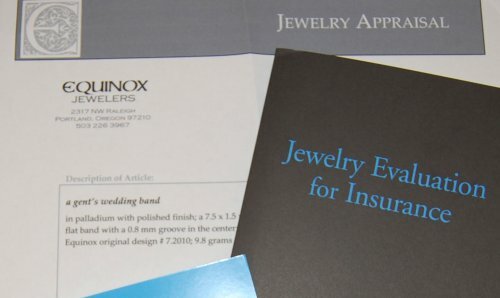 Equinox provides appraisals for jewelry that we create. These appraisals state the amount you would expect to pay to replace the item, and include a photo. This service is generally done at no charge. If you are using your own stones in an Equinox design, there may be a charge associated with the appraisal of these gems.